This essay collection offers a fascinating psychological analysis of the compelling and complex universe of George Lucas' richly rendered Star Wars series. A group of expert contributors examines such topics as family ties, Jedi qualities, masculinity, girl power, and the values embodied in both the "dark" and "light" sides of this psychologically spellbinding world. Everyone knows something about the Star Wars movies. Some people love them, others despise them, and many at least find a small fascination in the universe that George Lucas has created. The stories are epic and span light years of travel along with very visually stunning battles. Beyond the movies and even the plots people have taken to analyzing the stories for the psychological elements present. That is where this book comes in. 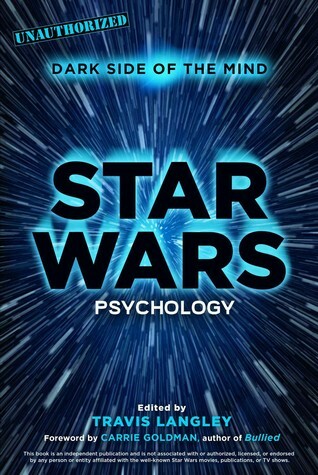 The editor Travis Langley, has compiled countless expert psychologist's accounts on topics that arise in the Star Wars universe. One topic that I really found interesting in this book, was the idea of humanizing and dehumanizing characters so that you feel a certain way about them. It made you really think about how much thought Lucas put into dehumanizing storm troopers that are humanoid by giving them masks yet also humanizing droids like R2-D2 even though he is a machine. Another part that really got me thinking is when the book goes into Darth Vader and what he represents. How he creates anxiety for the weak when he enters a room. How his mere presence creates an aura of power, which is representative of the aura that the empire holds by ruling the universe. This element of fear is what keeps people following the laws of the empire even when they aren't physically present. This book definitely dives into some deep topics, and its very interesting to see what the experts have to say about everything. This is something that psychologists and all others can enjoy on some level.